The Comet Cupboard aims to raise $5,000 to provide a healthy supply of food items for the fall semester, furthering our ability to ensure all UT Dallas students can meet their dietary and personal care needs. The Comet Cupboard is vital asset to the UT Dallas community. Historical analysis demonstrates a 1.4 point increase in student GPA for students utilizing the Cupboard. Campus awareness of this essential service continues to increase, and the need for items is greater than it has ever been. The Cupboard has seen a 17 percent increase in student visits and a 43% increase in items distributed. During the 2016-2017 academic year the Cupboard served more than 2,000 students, providing 21,893 essential items. The Comet Cupboard also offers UT Dallas students a tremendous opportunity to experience the fulfillment of helping others and contribute to the campus culture of service. It is our belief that the presence of an on-campus service engagement opportunity will result in the development of more well-rounded students. During the 2016-2017 academic year, the Cupboard utilized 219 volunteers for a total of 2,533 hours. 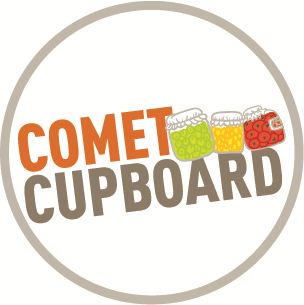 The Comet Cupboard is a UT Dallas food pantry initiative dedicated to helping students in need. Its primary mission is to provide necessary food and personal care items to members of the UT Dallas community, but its impact reaches much further. The Comet Cupboard acts as a service learning component of the undergraduate academic experience and strives to cultivate a community-oriented campus culture. In addition to providing essential meal and personal items, the Cupboard offers a friendly environment among users and volunteers. It is open five days a week and operated by student volunteers. The awareness for supplemental food pantries on campus is growing. Recent studies show a decrease in the number of traditional college students who receive support from family. The non-traditional college student, who supports a family and works full-time, is becoming the norm. There is also the misconception that students who can afford college tuition are able to afford food. Many students exhaust their funds on tuition, books, rent and gas, leaving very little for food, and almost no ability to make healthy dietary choices. Many students are forced to choose between food and textbooks. “Food insecure students had lower GPAs; compared to food-secure students, they were significantly less likely to fall into the 3.5-4.0 GPA category and more likely to fall into the 2.0-2.49 category,” (Maroto, Snelling, & Linck 2014). Your donation will feed one hungry student one meal per day for one week. A donor at this level will receive a shout out on our Comet Cupboard Facebook page. Your donation will feed two hungry students one meal per day and provide personal care items for one week. Donors at this level will receive a personal thank-you card. Your donation will feed one hungry student one meal per day and provide personal care items for one month. Donors at this level will receive recognition on the Comet Cupboard Donor Wall. Your donation will feed one hungry student one meal per day for one semester. Donors at this level will receive recognition on the Comet Cupboard Donor Wall. Your donation will feed two hungry students one meal per day and provide them with personal care items for one semester. Donors at this level will receive recognition on the Comet Cupboard Donor Wall, and a personal tour of the Comet Cupboard. Your gift will feed two hungry students one meal per day and provide personal care items for two semesters. Donors will receive recognition on the donor wall, given a personal tour of the cupboard, and take a picture with the Dean.